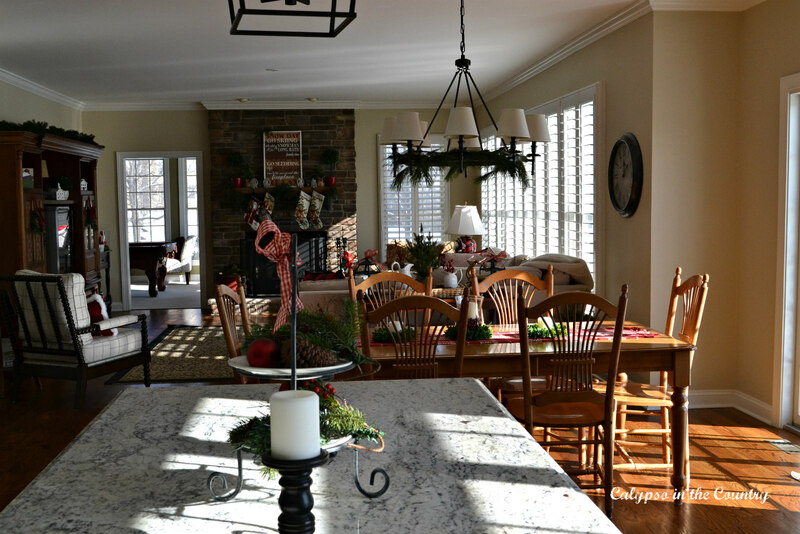 Although I am still digging out from the mess of the big day, I thought I would share a Christmas house tour. Better late than never, right? Even though we had snow last week, we didn’t end up with a white Christmas. The temperatures have dropped, though and it’s supposed to be freezing all week! 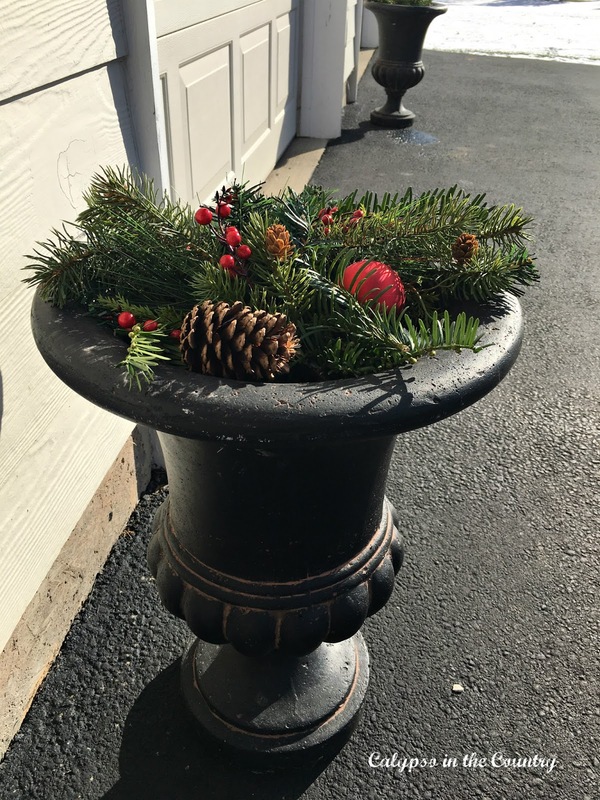 This year, I kept my outdoor decor simple. All I added were a couple trees on the porch with my new buffalo plaid door mat from Target. Ignore the ugly wires. I was so cold the day I snapped this photo so I didn’t bother trying to hide the cord. 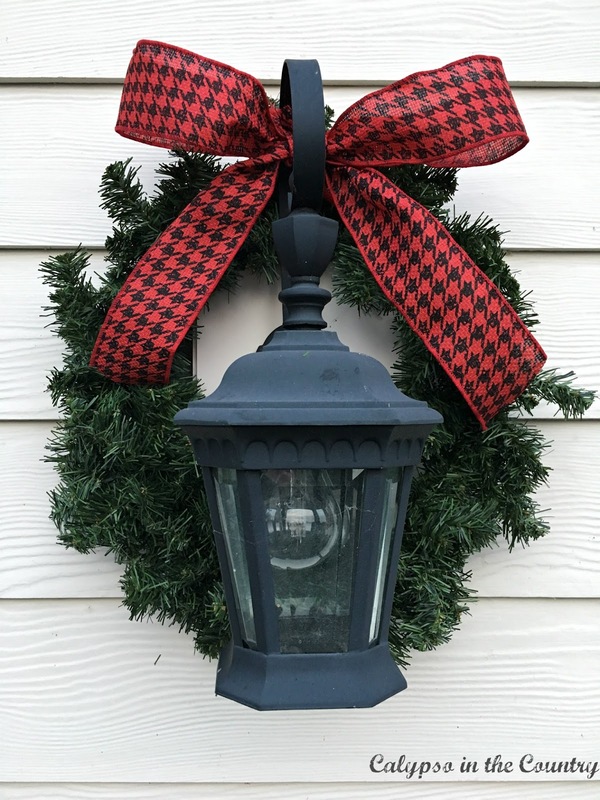 This year I also added wreaths and a bow to the lanterns by my garage. The bow was from last year’s foyer. I love the way the red really stands out against the cream colored siding. Since I didn’t have any plants in these urns, I just threw in some fresh greens and decorations. It was amazing they didn’t blow away with the crazy winds we’ve had! I guess it helped that I anchored a few of the ends into a florist foam block. As you can see, I used different ribbon for my bows this year. I went with red and white plaid to replace the red and black houndstooth I had in there last year. 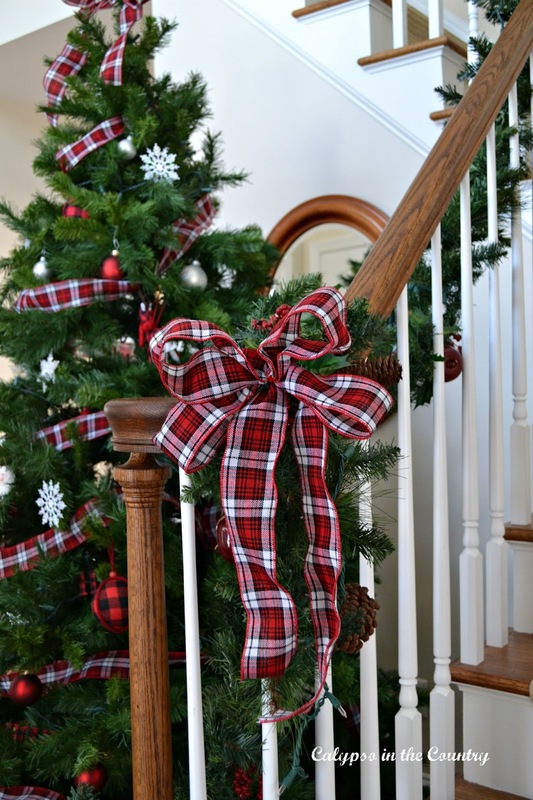 Continuing with the new ribbon, I added a few festive bows on the stairs to coordinate with the tree. Just the simple change of ribbon really freshens things up from year to year. 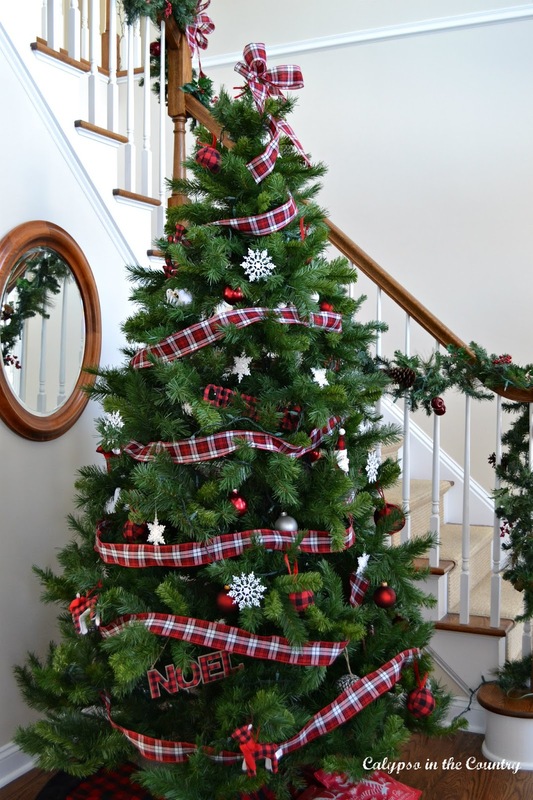 We use our artificial tree in the foyer and a real one in the living room. This tree is SO old and every year I vow this will be the last year for the pathetic thing. I have even tried fluffing it up by adding loose branches and garland to fill in the gaping holes everywhere. Believe me, it looks much worse in person and I know I am not fooling anyone with my attempts. My neighbor came over the other day and casually mentioned that Costco had some really nice artificial trees I should look into. Yeah, I can take a hint! In my kitchen, I kept things pretty simple again. 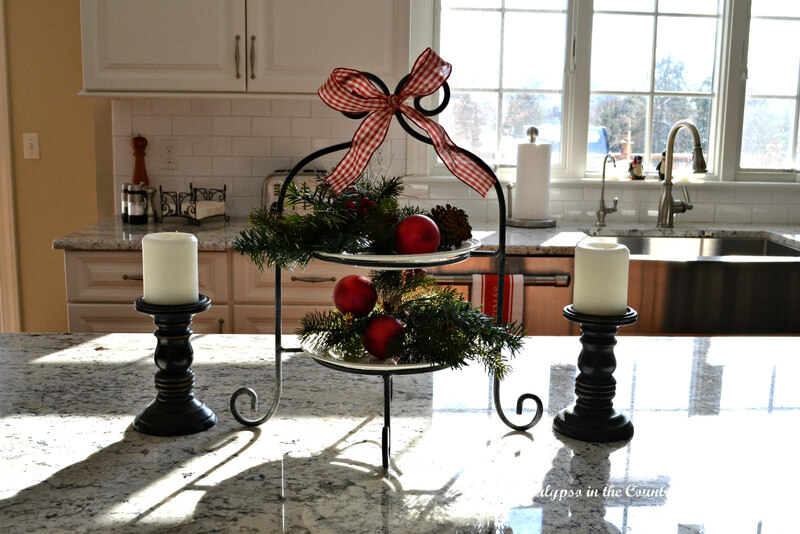 I always like to use my tiered tray on the island. It doesn’t take up too much space and adds some color. Here is the view into the family room. My kitchen table is set up for everyday in this photo but I recently set a Festive Table Setting that we ended up recreating for Christmas breakfast. 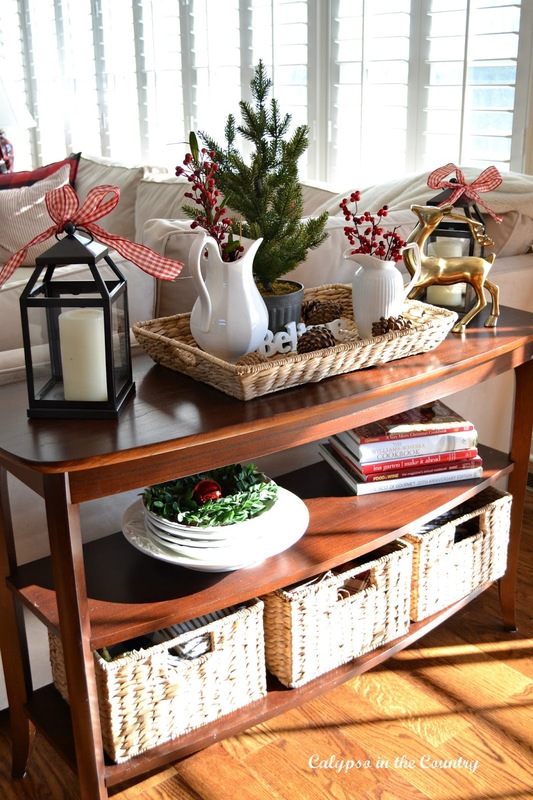 Recently, we moved this console table in from the dining room and I love having the extra storage in here. Not to mention, it’s a fun place to decorate! Adding ribbon suddenly makes anything festive! 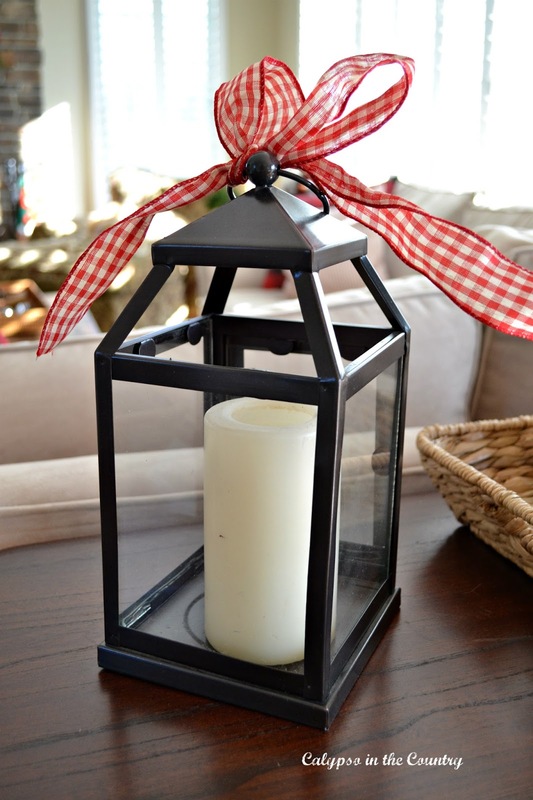 I can never get enough red and white checked ribbon for Christmas! 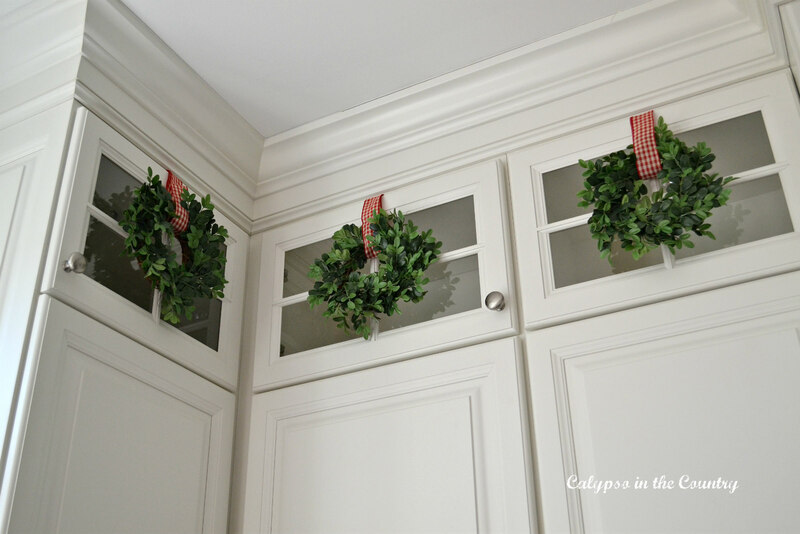 Once again, I used the same ribbon on my cabinets with wreaths this year. Why do I have a feeling I will be doing this every year? 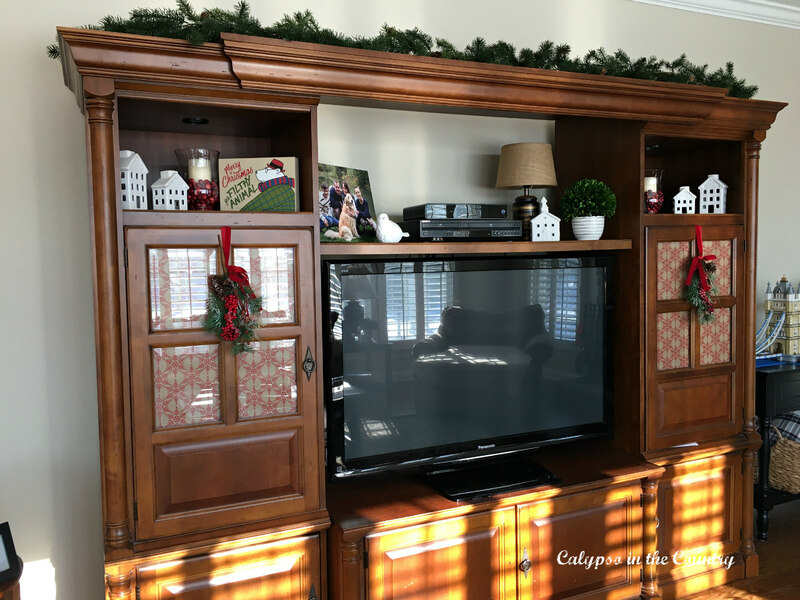 It’s almost like my cabinets were made for the wreaths! Not only does red pop against my white cabinets, but it also stands out against our rustic stone fireplace. Rosie was very happy to pose for me. She obviously loves Christmas! 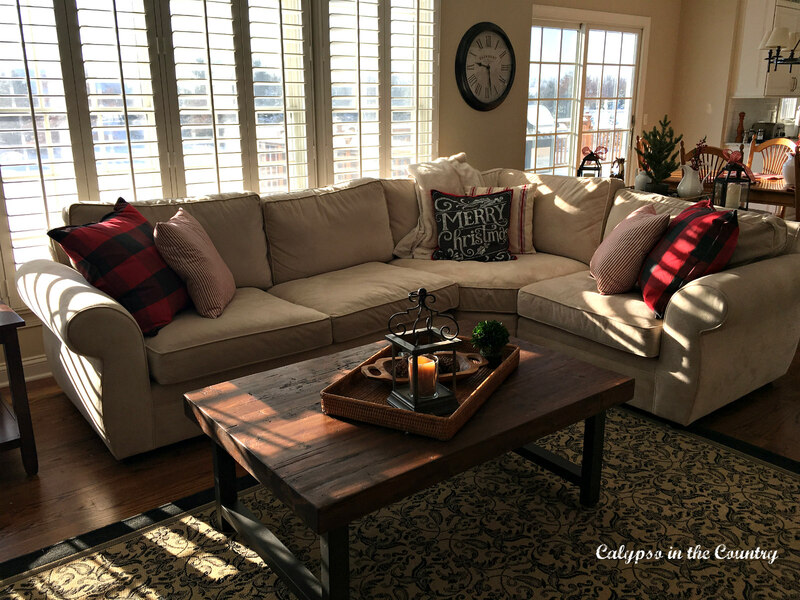 Red and black pillows dress up the cream colored sectional for the holidays. I think I am going to miss all this color in here after Christmas! 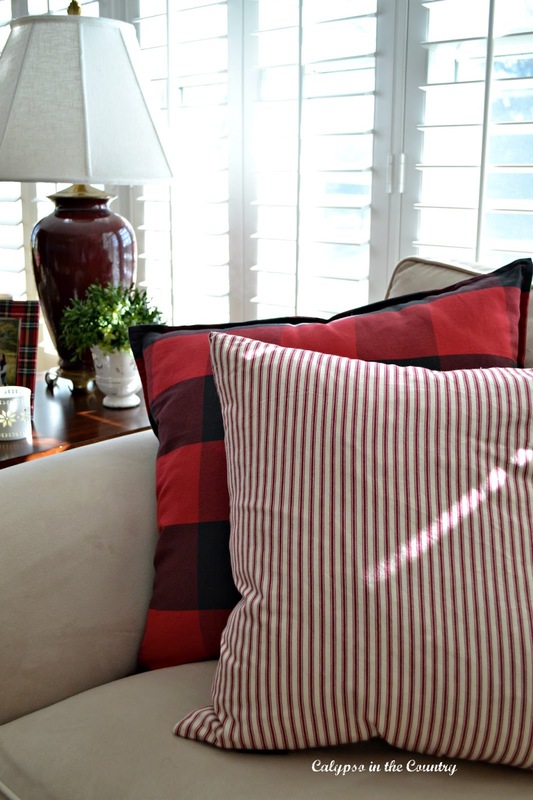 Maybe I will keep the red ticking striped pillows through Valentine’s Day. Not much can be done with this monstrosity of a TV cabinet. One thing I do each Christmas is cover the glass doors with wrapping paper. 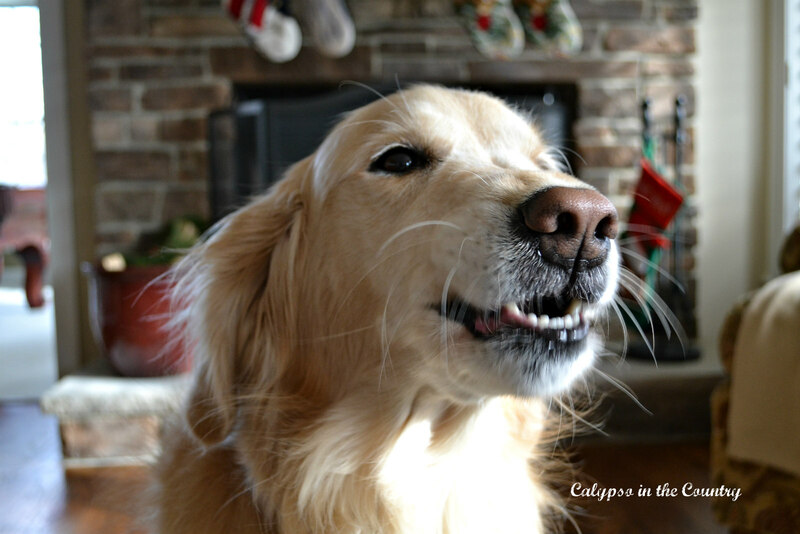 You can read all about that in my wrapping paper post. And here is the view back into the kitchen. On a sunny day, this is the place to be in my house! Then again, this is where we spend most of our time regardless of the weather! This is the only shot I have of the real tree in my living room. 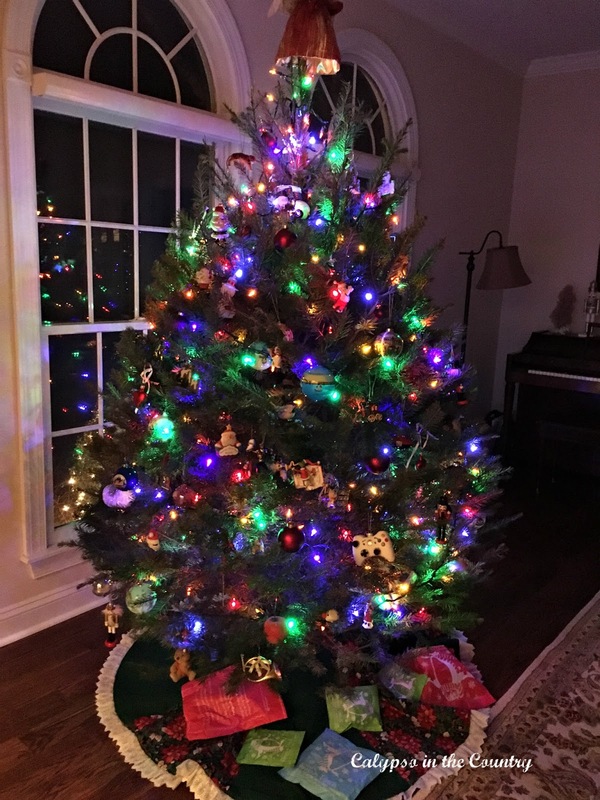 For some reason, we didn’t get around to our tree shopping until really late this year…At least it’s not dropping too many needles yet. By the time we take it down it will surely be a fire hazard. This photo was taken the night the kids and I decorated it. We always use all the traditional homemade and sentimental ornaments in here. That will never change and I am fine with that. In fact, I am more than fine with that. Family traditions are what we cherish from year to year. 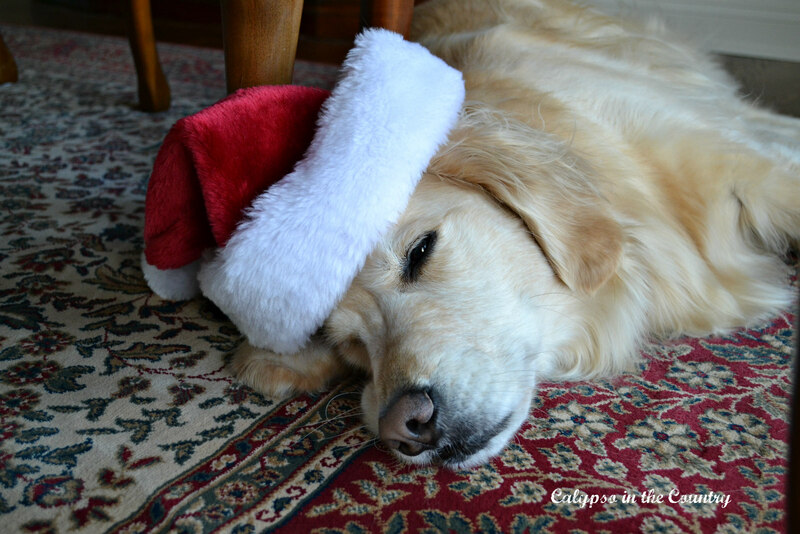 Apparently, it has become a tradition for Rosie to wear herself out at Christmas! Once I finish cleaning, we will continue to enjoy the Christmas decor until New Year’s Day. Then it all comes down so we are fresh for the new year! Shelley, thank you for opening the door to your beautiful home. I enjoyed the tour. I also love red and white ribbon. Your tress are so pretty and I love a tree full of memories. My decorations will probably come down this weekend. Happy New Year! Beautiful Shelley. 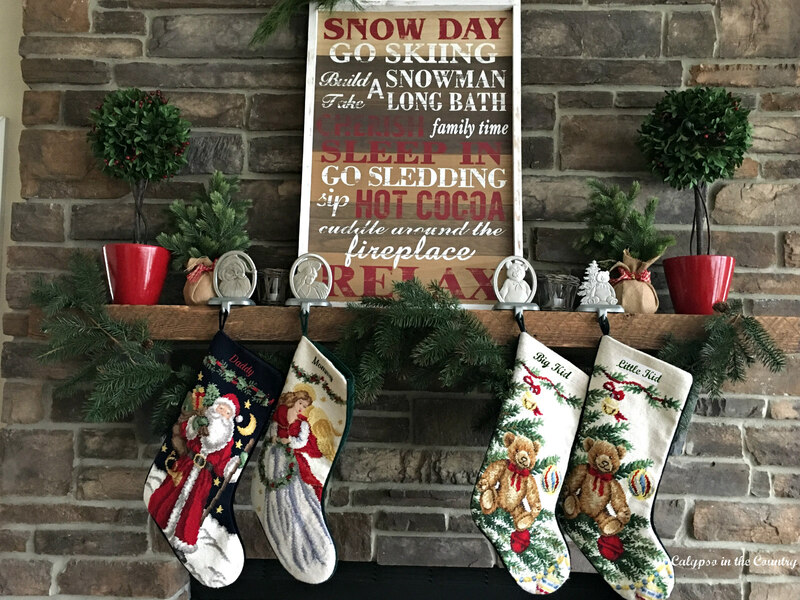 I love your mantle! And sweet Rosie, so cute. 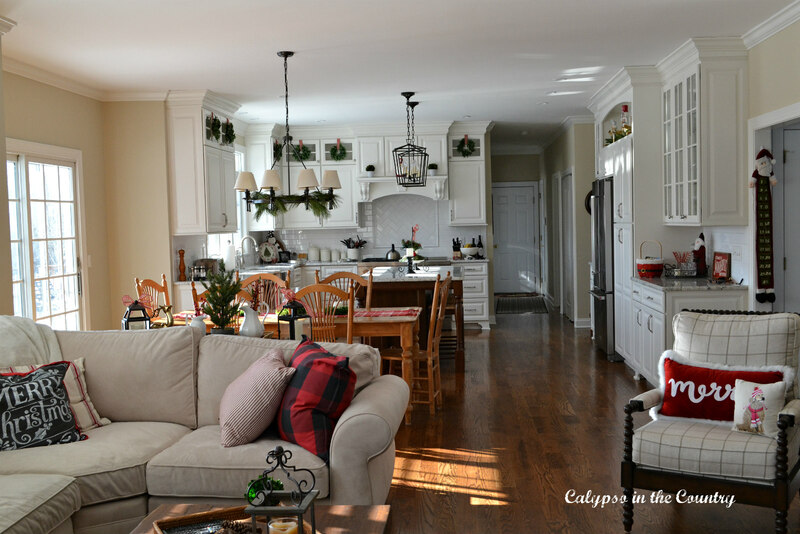 Your home looks lovely all decked out! 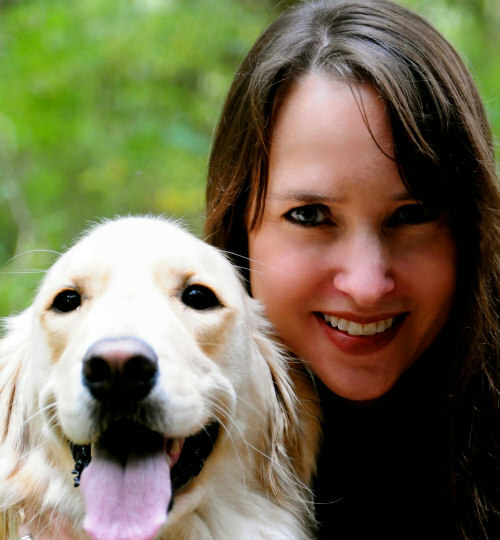 Love the Rosie smile picture. We take our Christmas decorations down on New Years Eve day. Love your house, everything looks so pretty and of course you know that I am crazy about your kitchen. Your home looks so festive and inviting. It spells welcome and cozy. I love your new sectional and that you can change your pillows. I'm still enjoying the tree with the lights on. We were gone five days so our tree will stay up until New Year's. I'm not ready to change yet. Beautiful, Shelley! 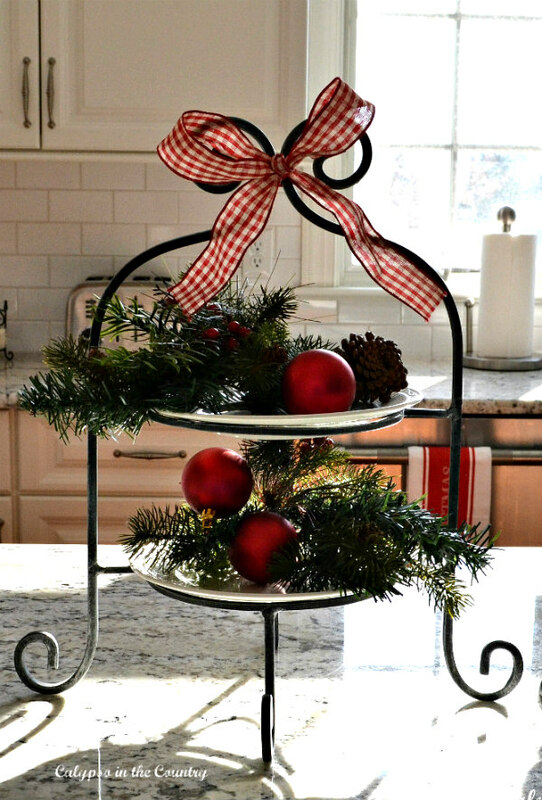 I just love your traditional decorations and touches of red. Perfect! Happy New Year! Oh Shelley, today was the day for me to take all the decorations down. 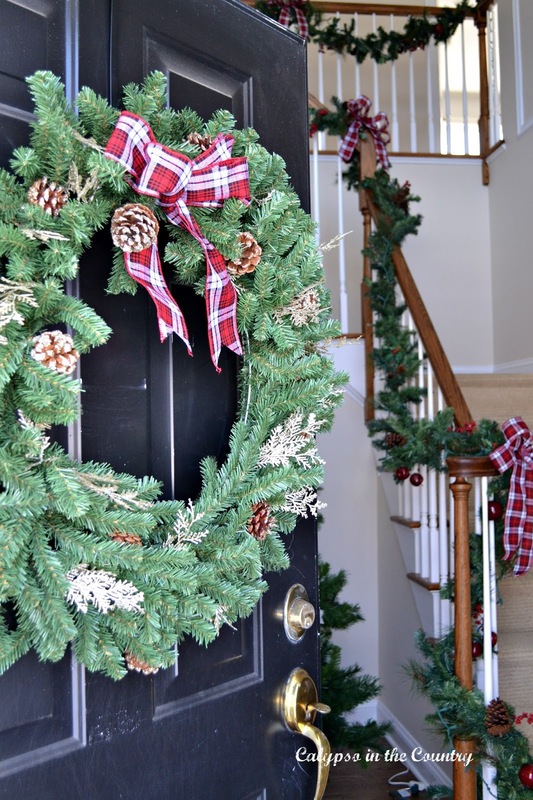 Your home looked gorgeous all decked out for the holidays! Love the fireplace, your kitchen and the staircase, so pretty! Shelley, you have such a beautiful home. 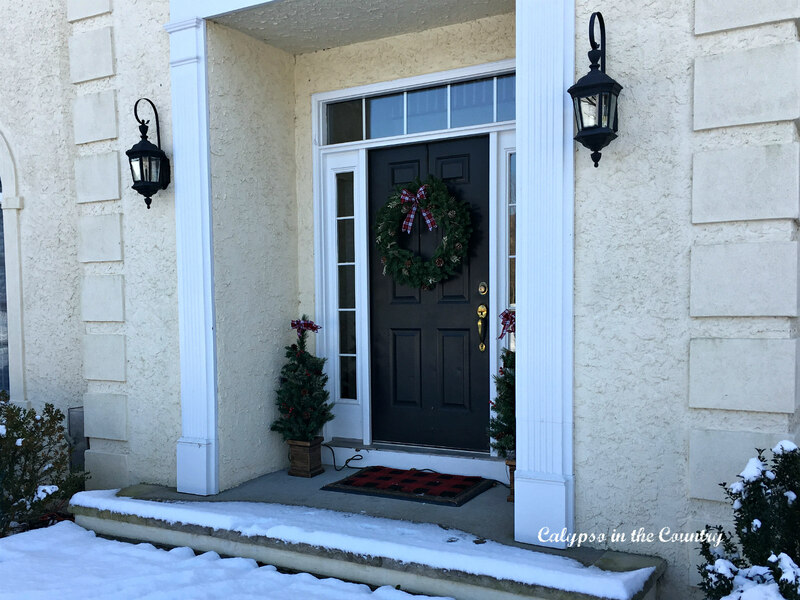 We took our decorations down a few days after Christmas, while my hubby was still home from winter break. This is a lovely, warm and welcoming family home. Do not apologise for your lovely foyer tree or anything else, it is all good. Your boys will have good memories of your efforts. Well done. Thank you so much for your sweet comment! Yes, you are right, the memories are the most important thing. Thanks for stopping by!